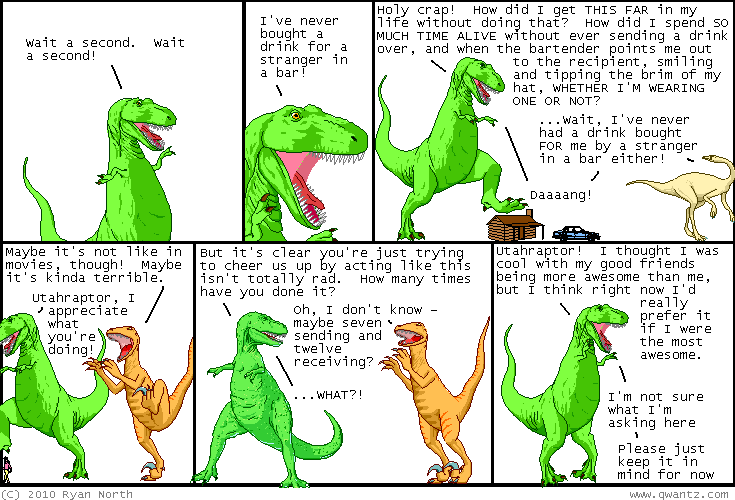 Dinosaur Comics - January 8th, 2010 - awesome fun times! –The secret is to be CONTROVERSIAL! January 8th, 2010: I added a little Twitter box to the site! It's beneath this "WHAT ARE THE HAPS, MY FRIEND" section and is called "OKAY BUT WHAT ARE THE TWITTER HAPS THEN", hopefully mirroring your thought process exactly. It only shows up beneath the most recent comic and only shows non-replies, so hopefully it will be relevant while also letting you know what I dreamed about last night! (Leonard Nimoy, it was Leonard Nimoy). One year ago today: t-rex has become a counselship relationer.